"Good Fridge/Freezer and I love the motor being external so the space is great!" The product is holding the temperature consistent, however, when on freezer, the dividing wall needs to be to aid with the freezing of products further away from the freezing/temperature components. Great customer service! They changed the openings for me, tailored the products to my needs. Haven't used it on Its first trip yet. Plugged it in and used it at home and really happy with it. This is the best fridge i have ever used, it’s low power draw means it runs solely off of my solar panel and independent battery set up. The low profile fridge fits on my draw set up and I can use the fridge under my canopy or by pulling the fridge slide out. My experience was great, they answered all my questions quick and made my purchase really easy. I have this fridge freezer it works a treat and keeps everything cold but When I got my fridge/freezer it was missing the divider I called my generator up and told them this and that week I had the divider in my hand. I had a bad experience with TOLL, they couldn't find my package first then did not pick it up at the time which was allocated, then I put a stop on it so I would pick it up from the local office and they still sent it out.. TOLL is no good. I would buy from them but they need to change postal services. Great product. Works very well in extreme heat conditions. Good pricing, great service and delivery. Evakool Fibreglass 60 Litre Fridge Freezer, 5yr warranty. Evakool offers you Australia’s most ingenious, versatile and user friendly portable 12V/24V Fridge-Freezer combination. It combines Evakool’s renowned fully insulated fibreglass cabinet with the world leading Evakool EDC 25 Compressor. NOW WITH DIGITAL CONTROLS. The unique design of the Evakool Fridge Freezer offers you the flexibility to adjust the capacity of both the fridge and freezer compartments. Your Evakool Fridge Freezer can function as a fridge, as a freezer or as a fridge-freezer combination… the choice is yours. This fridge runs on 12 or 24 volt DC power. However, an Evakool Power Adaptor (RRP $149) is included with this fridge (image below). 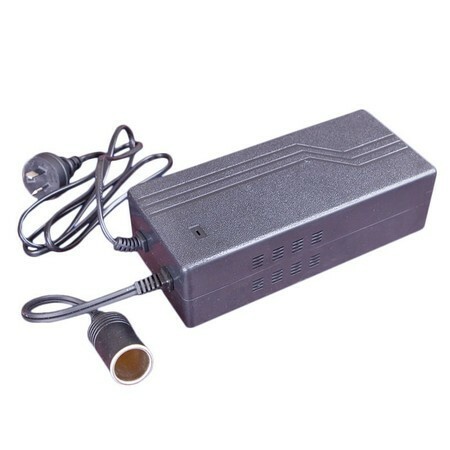 This Power Adaptor enables you to run the fridge from a 240 Volt AC mains power source. This is popular when you want to conserve battery power. The included Adaptor comes inside the box with your fridge and has a rated peak power output of 10 Amps. A larger, Heavy Duty Evakool Adaptor with rated peak power output of 15 Amps is available in the above Accessories List as an optional extra. Strong, well built and well insulated. Quality components, great warranty and looks the business. Very happy with it. Shopping with MyGenerator was a really positive experience. In fact, it was one of my best online experiences to date. Professional, informative, friendly and prompt. Will definitely buy from MyGenerator again. Highly recommended. Not only is the 60L a slick bit of refrigeration, it also has a slick exterior finish, is relatively light to handle, and it's low profile means it can fit into our camper trailer with ease! Very impressed, that a fridge can also be a freezer, or both at the same time. The best invention ever. Thanks Evakool. WHEN I LOOKED ON LINE A THOUGH IT WAS A DUAL CONTROL FRIDGE AND FREEZER ?? Great product, easy set up and no fuss. Very light weight for the size of the fridge too! From the live chat to delivery was exceptional, well done guys! Low draw - brilliant insulation properties. Feedback and quality of enquiries brilliant from distributor My generator ( better than the manufacturer ) also price comparison substantially cheaper through Mygenerator - highly recommend Mygenerator. My Generator had it at the right price and the service was speedy and excellent. I ordered the fridge at a competitive price and it was delivered promptly. Quality. As described and with good communication. I would use My Generator again no problems. I shopped n shopped n sold n swooped and then I found this baby she is a real corker! We bought one of these after a recommendation from a friend. A good price, a combination of fridge AND freezer, and the fact that they are Australian Made sold us straight away. Having used the product while camping and running on 12v I can say that the product does what it says it does and just the way my friend says, and what I expected.